A lot has happened with storefronts at Customized Girl in the last couple of months. We have rolled out some new storefront features and are gearing up for the next marketing pushes. With so many new additions, we want to make sure all storefront owners are up to date and have all the appropriate information to help better market and promote their great efforts. If you ever uploaded a lot of high-res images to your account, you might have noticed that the Upload Image tab within the Design Center could get pretty slow. Well not any more! If you do currently have a lot of images in this tab, click on it, and wait for just a minute. The system will generate thumbnail previews for all of your images. The next time to you visit the Design Center, from any browser or device, this tab will load much more quickly. If you have an image that you’d like to display on the design details page (maybe it is a photo of someone wearing your design, maybe it’s a matching-best-friends design), you can now upload it right below the Add to Cart button! You can also link that photo a unique tag in the gallery. So if you have one design that is part of a set, you can add a unique tag to each design in the set, and then upload an image and link the image to that unique tag. We personally love this feature because customers love to see photos of people wearing the product. It helps them make better purchase decisions and more importantly, they get to see how other customers love your product. This is also a great feature if you want to show off your front and back design in one image to promote on social media. Under your storefront description you will now notice a Twitter and Facebook like and share button. This feature makes it easier for storefront owners to share their storefronts with friends and family or for customer who want to share your products on social media! St. Patrick’s Day – With St. Patrick’s Day being the next big holiday a lot of customers are looking for that unique and green design to catch people’s attention. Customized Girl has recently added a large collection of new and trendy art to the gallery to help with your designs. Green apparel is always the biggest hit with bar crawls, running events, and businesses who are doing their own promoting on St. Patrick’s Day. Spring Break – This winter has been real rough for our customers and we are sure everyone is thinking about hot sandy beaches for their spring break destinations this year. Our neon apparel, crop tops, and bathing suits with trendy or even hilarious designs concepts are the best sellers for spring break activities. Easter – Easter is on April 5th this year and our biggest product pushes are in our custom stuffed animals and first Easter onesies. Spring Sports – Sports is one of our biggest niche markets on Customized Girl so if sports concepts are your game then design on. A list of sports played in the spring are baseball, softball, soccer, and lacrosse. Let us know if we’ve missed any! Prom – If you didn’t know that Prom is important then let us tell you a thing or two about promposals. It’s a big deal. Cute and clever ways to ask their dates to prom is in and our prom bears give the user a classic but customized way of asking their date to prom. We’re marketing your designs too! We include a “featured storefront” in our marketing emails! We write about storefronts on our blog! It’s always useful to closely follow along with the Customized Girl blog to see what is trending, what we are promoting, and all the great additions in art and products that have been recently added to the website. 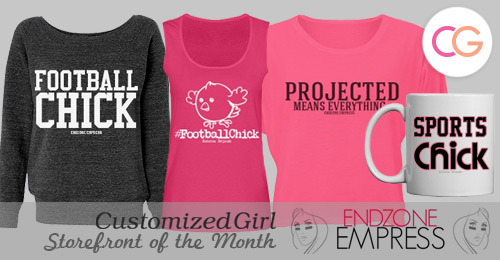 If you need information on Customized Girl storefronts check out our FAQ or email us at CGstores@eretailing.com.